I’ve made my first loaf of sourdough bread now. 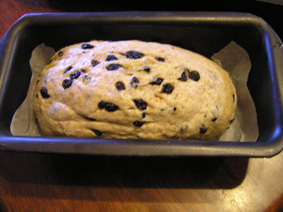 It is far from the best bread I’ve ever made, largely because I’ve never ‘air-kneaded’ dough before and wasn’t entirely clear how it was done or what I was aiming for. 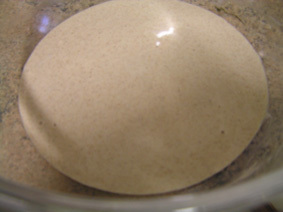 I’ve since found an online video that shows me what I should have been doing, and explains why the dough never did get to the stage it should have, even after about double the time air-kneading that the recipe suggested. At some point soon I’ll be writing a review of Wild Sourdough, the book I am working from, because it is both very useful and incredibly frustrating, but for now, I present an illustrated life-cycle of the sourdough, as observed in a Coburg kitchen. 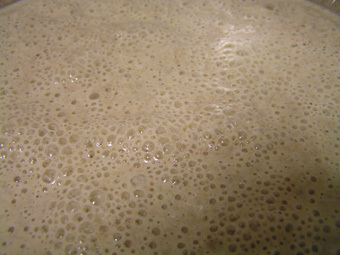 As you will recall from yesterday, I started with the starter (it’s a very good place to start…), which I fed with flour and water to double its volume, and then left to ferment for about 10 hours while I went to work, came home and had dinner. Incidentally, Melbourne tap water did indeed work just fine. Well-fed and ready for action! 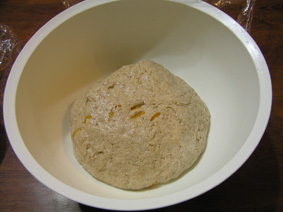 Half the fed starter went back into the fridge, where it will settle down, ready for its next feed, and the other half went into a bowl with water, rye flour, spelt flour, marmelade and a little salt, to become dough. 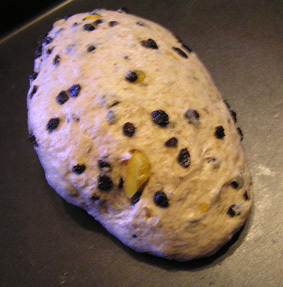 Sourdough needs a very long time to rise, so I chopped up the candied orange and measured out the currants and fennel seeds to add later, and left the dough to sit and rise slowly overnight. 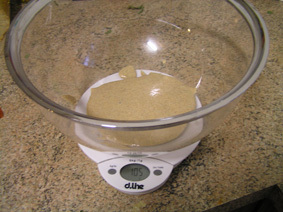 This turned out to be a mistake, because I then spent the whole night stressing about whether the dough was going to rise too much and then collapse again before I got up in the morning, and as a result, I didn’t get much sleep and got up fairly early to inspect it. 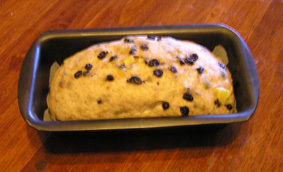 It had risen, though not as brilliantly as it should have, due to my aforementioned kneading incompetence, so I added the currants, fennel seeds and candied orange peel, kneaded it all together, and divided it into two small loaves (one in a tin, one free-form). Then I went back to bed while it rose for another two hours. 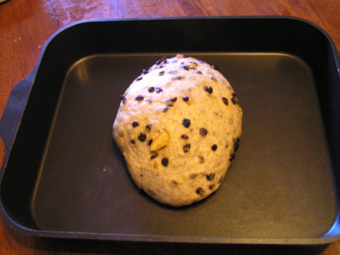 After that, it was just a matter of baking the bread. And eating it, of course. 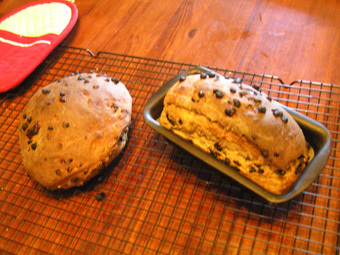 The flavour is actually really good – you can taste the rye very well, though it’s less sour than I would have thought. 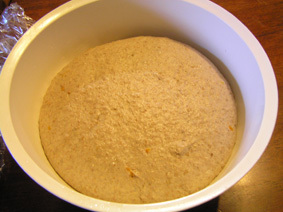 I’m going to try for the dough retardation method next time, in which you let it rise for several days in the fridge – I gather this gets a better fermentation. 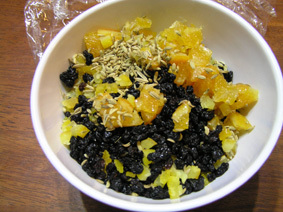 The orange and fennel were really good additions to the rye; the currants were nice, too, but less outstanding – though they did provide a needed sweetness. 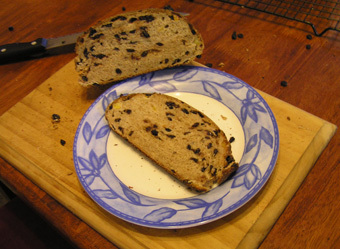 The crumb, however, was definitely denser than it should have been, which was disappointing.